Blog | Don's Brother | Moving On…. My Camino is over. I painfully walked about 31 miles over three days before realizing that I needed to stop. Perhaps I should say, “I walked 30 miles painfully” because only the first mile out of St. Jean Pied de Port was without some distress. Once the road started to ascend, the struggle began. Initially it was difficulty breathing on the continuous climb that gave me concern. Stoping every 400 yards to catch my breath soon became every 100 yards and finally every 10 feet. I didn’t remember feeling this distressed on the accent last August; however, I just assumed that I wasn’t in top shape anymore since I had not been running lately. I rationalized that only walking 6 or 7 miles most days on a relatively flat surface was not enough conditioning for the Camino. By the time I reached Orisson at the 4.8 mile mark, I was totally exhausted. There was no physical way I could have continued. Then after arriving in Roncevalles, I noticed the discomfort in my left calf as I walked around the village. I thought nothing of it and fully expected to make good time on the much more level surface to Zubiri the following day. Yet from the outset on day two I was hurting. By noon my normally steady, 3 mile an hour pace had been reduced to less than 2 miles an hour. And my normal gait was transforming into a limp. Since I had only sparingly used the one trekking pole I bought in St. Jean for my first Camino last year, I had decided to forgo poles this time around. Realizing how desperately I needed something to lean on, I quickly regretted that decision. Momentarily alone, with not a Pilgrim in sight ahead nor one behind me when I stopped to look over my shoulder, I remember offering up a short prayer for assistance. Gazing to my left, I spotted a Godsend just off the trail. A slender stick, about five feet in length, protruded from a small pile of tangled vines. Even though I had to walk down a slight slope to retrieve it, the slender, almost straight limb became my companion for the remainder of my walk. I smiled as I left it standing in the corner of my hotel room early this morning. It almost had a glow about it, as the light from the streets of Pamplona shone through gossamer sheers, onto its bark, in the pre-dawn hour. It had served me well over the final 20 miles. But much occurred between the finding of the stick and the leaving it in my hotel room. Yesterday morning I spent about two hours contemplating my options, and there were many. While enjoying two cups of “cafe y leche y tostado,” I even tried to book an Airbnb for four nights to rest in Pamplona. Without results, then I looked at train schedules thinking I could skip ahead and reduce my Camino to maybe 200 or 300 miles after several days of rest. I even considered the possibility of leaving Spain and traveling some in other European countries. Finally I got a bag of ice from my waitress and returned to my room. While lying on my bed and icing the calf, on what would have been a beautiful day to hike, I read articles on my phone that related to my injury. I had treated a strained calf from running more than once, but something made me think that maybe there was more. I also re-read some encouraging emails from friends. In one, the line, “but maybe (please!) think about seeing a doctor” caught my attention. At that moment I thought that maybe I should. A very long, almost 9 hour afternoon, and early evening, began as I asked the clerk at the hotel directions to the University Hospital. She recommended a nearby clinic instead that was close enough to walk to. Clinics in Spain aren’t unlike those in Georgia. There was paperwork, a consultation, a wait, and finally an examination of the injured leg. The young female doctor spoke very good English. I was grateful since I had relied on my Spanish with the registration and the consultation. After about fifteen minutes of a thorough check of the injured area (by clinic standards), she told me I needed to go to the emergency room at the hospital. One of the nurses called a taxi, and I waited outside for about ten minutes for it to arrive. When I walked into Hospital de Navarra, and saw the almost full waiting area, I reminded myself that I really had no place to be and to be patient. Like at the clinic, there was registration, an initial examination, blood tests, an extended wait for results, an ultrasound, a diagnosis by the radiologist, another wait, and finally, an explanation of the diagnosis with the doctor, and a strong suggestion that I discontinue my Camino and return to the United States. So I am taking the doctor’s orders. I have a deep vein thrombosis running from just below my knee (where my initial discomfort began) to my lower calf. I was injected with medication and given instructions for treatment of the blood clots. Sometimes as a fit athlete, even in our later years, we tend to overlook possible life-threatening signs. My leg was sore, it was swollen, it had a very red coloration, my resting heart rate had increased, I was de-hydrated, and the symptoms weren’t markedly improving. The decision to seek medical help was obviously the right one. For six months I have checked my Delta app almost daily to see how many days until my flight to Madrid. I’ve improved my Spanish quite a bit and learned more about the pilgrimage. I’ve had the opportunity to speak on four occasions about my journey across northern Spain last year. And I’ve tried to learn more about the Catholic Church and Mass. Now, only six days after I flew from Atlanta to Madrid, it is over. But most of all I am grateful for the medical people who treated me in Pamplona. With God’s grace there will another Camino. When that will be, I do not know. What I do feel is that one day I will walk again, as a Pilgrim, along the Way, and stand before the Cathedral of St.James…..in Santiago. The difficulties I encountered on the first day of my Camino increased on days two and three. Walking away from Roncesvalles at 9:00 yesterday, the very mild soreness in my left calf only slightly detracted from the beautiful spring morning in Spain. Unfortunately, “mild” became moderate and then severe before I reached Zuribi late in the afternoon. It took me almost eight hours to cover the same distance I walked in just under five last summer. The final three miles could be considered more of a limp than a walk. Still I did enjoy the company of several other pilgrims. I walked a good way with Tom, a judge from Portland, Oregon and mother and daughter, Margaley and Avin from Venezuela. Mother is a pediatrician and daughter is an engineer. Both speak some English, so Tom and I enjoyed practicing our Spanish as the ladies responded in English. Since they were traveling at about my pace, it felt good to have some company. In fact, I think my leg hurt less while sharing stories with my new friends. I also met two ladies from Asheville, Alicia and Tinker, and several Germans whose names I didn’t get. Despite the very warm day and my maladies, it was a good day nevertheless. Had it not been for my discomfort, I would have been hiking faster and probably never would have met any of these good people. When I finally reached Zubiri, I got the last room at Pension Amets. The proprietor even gave me two ice packs for my ailments. After a brief rest, I walked about a block for supper and then returned to my room to rest some more and ice again. It was not the way I had hoped to begin my Camino, but the fellowship with other pilgrims and the beauty of the Way have still brought a smile to my lips often. Today I awoke with high expectations after feeling a slight improvement in my legs. First I joined Annette and her son, Keith, from Ireland, Micho from Germany, and Gabbriel from Switzerland for breakfast at the pension. Annette has four grown sons, and all have done the Camino. Wanting to do a week herself, Annette convinced Keith to join her. She has also persuaded him to stay in hotels and pensions rather than hostels, although Keith says he would prefer the albergues. My walking day started off well enough as I crossed the medieval bridge over the Arga river. The trail parallels the river for much of the walk today to the outskirts of Pamplona. I walked briefly with a young Korean who said his American name is Bill. Speaking excellent English, Bill said he had been to the US several times and that his father, a professor, had received his undergraduate degree from the University of Connecticut. Bill is traveling with a group of about fifteen. I also met pilgrims from Norway, Australia, Brazil, California, and Ohio. The highlight of the day was a stop at Zabaldika and the Iglesia de San Esteban, (St. Stephens church). I, along with other pilgrims, was also given an explanation of the altarpiece by one of the Sisters of the Society of the Sacred Heart. We then visited the bell tower. Zabaldika is on one of the alternate routes of the Camino Frances which I didn’t travel last year. After leaving the church the remainder of my day was a struggle. I was barely walking at 1.5 miles an hour when I reached the suburbs of Pamplona. I rested often, but still the pain from both my legs was agonizing. Upon reaching the city center, I quickly located my hotel and checked in for two nights. Later I walked to Plaza de Castillo and had supper with Spencer, a Pilgrim from England. Then it was back to my room for more rest. I plan to really take it easy tomorrow and hope that I will be walking without a limp soon. Yes, I’m a bit disheartened; however, I am in Spain, slowly walking forward Santiago. It has been a challenging beginning to my second trek on El Camino de Santiago. I’ve been dehydrated, sleep deprived for two days, and nursing tightness in my upper calf behind my left knee. Because of these setbacks, I have decided to re-start” my Camino on Thursday from Roncevalles. Having already completed the Camino Frances in its entirety in August and September, 2017, I’m not that concerned that my Compostela will state that I walked 774 kilometers rather than 799. After all, all that is actually needed to register a completed Camino is 100 kilometers, which I why a large number of pilgrims begin from Sarria and only walk five or six days into Santiago. My difficulties began early in my walk yesterday on leaving the town of St. Jean Pied de Port in the French Pyrenees. On the initial significant climb, I labored with breathing and immediately felt the soreness in my calf increase. It was going to be a tough morning for hiking. To somewhat alleviate my physical issues, I rested often which gave me the opportunity to admire the absolutely stunning scenery on a picture-perfect day in France. Mountain ranges, some whose peaks were still covered in snow at the higher elevations, were visible over fifty miles in the distance. At least I was sharing the beauty will several new friends that I had met the night before at the hostel. My plan for the day had been to walk the entire 15.6 miles to Roncesvalles because I had purposely avoided making a reservation at the poplar Orisson, 4.8 miles from St. Jean. As I struggled for three hours covering the mileage, I quickly realized that there was little opportunity to make it all the way to Roncevalles by late afternoon. So on the first day of my Camino I chose the only option that sounded sane. With no beds available at Orisson, I opted to be driven from Orisson to Roncevalles with some other pilgrims. This was not what I expected to do earlier in the day; however, given the extremely warm (low 80s) conditions, my lack of energy (most likely due to my approximately total of five hours of sleep over the past 48 hours and inability to consume enough water), it was definitely the correct decision. After getting to Roncevalles I secured a room in the very modern hotel part of the monastery which was completed in 1085. My accommodations are immaculate. Since I had stayed in the dorm here last year, I figured an upgrade was deserved. After a much-needed long shower, I shared a Pilgrim dinner with others and then attended Mass to receive the Pilgrim blessing for my journey. Despite my setback, I am looking forward to beginning again tomorrow. Like today, the weather is expected to be sunny and warm. With a much more level path, and after a good night’s sleep, I am hoping to be invigorated in the morning. Even though I’m not 100% physically, the beauty of the Camino and the pilgrims I have already met from England, Germany, Canada, Portugal, Belgium, South Africa, the US, and many other countries, will sustain me as walk on toward Zubiri. It is time to return. The Camino has been calling since only a few days after I returned home late last summer. In one week I will be on the Way again. As before, I plan to begin my pilgrimage in St. Jean Pied de Port, a small French village nestled in the Pyrenees. My destination: Santiago de Compostela and the final resting place of St. James, an apostle to Jesus and the patron saint of Spain. Along the way, I will strive to immerse myself in Spanish culture and marvel at the beauty of antiquity that may be observed continuously. I hope to see much, feel much, taste much, and to live with a constant feeling of inner peace. In some ways this walk will be similar to my first Camino. In many ways it will be different. Even though I’ll be repeating the Camino Frances, I plan to travel some of the alternate routes off of the main one, while I’ll still make my way through most of the same cities, towns, and villages that make this journey so special. In all likelihood, I’ll spend significant time in a few of the same places. But I also plan to visit sites I passed by back in August and September of last year. I’ll also venture on to Finisterre (the end of the world) and Muxia, after arriving in Santiago. And of course, the pilgrims with whom I share the adventure will be different. There’s something truly inspiring about setting out on a journey of around eight weeks without knowing who I will encounter and from what countries these fellow travelers will have come. That in itself is part of the mystique of the Way….camaraderie and fellowship with those who are different, but with whom we share the greatest gift of mankind…our humanity. We are all seekers, transients on this planet, trying to better understand each other’s uniqueness. Like before, I expect my faith to increase as I, a member of the United Methodist Church, visit cathedrals and churches several hundred years old and attend Mass with Catholics from around the world. El Camino de Santiago offers all of its sojourners the opportunity to experience the timelessness of Christianity. Pilgrims of 2018 walk the same routes that their brethren have traversed for over one thousand years. We will share our stories, our faith, sleeping quarters at times, and an abundance of good food at Pilgrim dinners. And together we will be afforded the opportunity to receive a special blessing each night at the Pilgrim Mass. I am smiling already in anticipation. I plan to journal again as well. Some entries will be descriptive. A few informative. And I imagine that many will be reflective. It’s a challenge not to look within oneself often while experiencing so much of the grandeur that God affords us. Hopefully, many pieces will provide my readers with a sense of connectivity to those with whom I will be walking. I pray I can accomplish the task of truly sharing my Camino with each of you. The next adventure is just over the horizon…soon I will be back on the Way, again heading toward Santiago. My arrival in Madrid in about two weeks will mark my second trip to Spain. The first occurred way back in 1973 when I ventured over to Europe shortly after graduating from college. A mere lad of 22, I had no knowledge of the Camino de Santiago then. In fact, before I made my way to the land of Cervantes, I spent about a month in Germany. A childhood friend who was studying in Munich offered me a free place to crash for as long as I wanted. No second urging was needed. I bought a “student fare” airline ticket for less than $400 round trip, purchased $300 in travelers cheques, and put graduate school on hold. In early October I boarded a plane in Columbus, and connected in Atlanta, New York, and Frankfurt, before eventually arriving in the Bavarian capital. It was the final week of Oktoberfest. All was good. While my friend worked and attended classes, I toured the city, visiting museums, cathedrals, and an occasional McDonalds for a much-needed “almost” American meal. I rode the trams and experienced just about everything that Munich had to offer. I visited the Olympic Village from the previous years summer games, did a day trip to Nymphenburg Palace, and took a train to the Alpine city of Garmisch. When around four weeks had passed, I decided that I wanted to see more of Europe before returning to Georgia. So I bought a third class train ticket for Madrid with the opportunity to de-train wherever I wished along the way. The first significant stop, Zurich, was much too expensive. I stayed briefly in Geneva, passed through Avignon in the middle of the night, and decided I needed a bed when I got to Barcelona. After a few days there I took an overnight journey (that’s all my cheap ticket would allow) to Madrid. I checked into a pension on Jose Antonio which was under $10 a night. After a Sunday afternoon at the Corrida de Toros, an almost full day in the Prado, a tour of the Royal Palace and photo opt at the statue of Don Quixote and Sancho, I planned my return to the US. I was booked on now defunct TWA; however, it turned out their flight attendants were on strike, so they re-scheduled me with Iberia. The lady at the TWA office in Madrid told me that since I was flying back to the States from Madrid rather than from Munich, where the flight had originally been booked, that I would be owed a small refund. I would have to wait to collect when I got to Columbus. A couple of weeks later I received a check for somewhere between $20 and $30, as I remember. Airline policies have certainly changed. I don’t expect to do much sightseeing in the capital city on this trip. What I do expect is a beautiful traverse through northern Spain and an opportunity to join with other pilgrims from all over the world on a spiritual walk to Santiago. Now 44 years later, I think this visit to Spain may be just as exciting as that first. I have a lot more mileage on my legs, but they’re inspired and looking forward to the journey. After a thirty-seven year teaching career, I walked out of the classroom for good in May, 2012. I’ve been officially retired now for over five years. At 66, amazingly, I still feel young. At least young enough for an occasional adventure. And that’s how I’m viewing my upcoming trip to Spain—-as another adventure. I hope to find spiritual relevance along the way, but for now I’m focusing more on the physical journey than I am the internal experience. During those years as an educator, I’ve also been a dedicated runner, logging over 59,000 miles in a journal that I’ve kept since 1980. For the past three years, some things have changed. After a series of minor injuries, I’ve been more of a sporadic runner than a dedicated one. Still, for the past few months I’ve been maintaining about 20 miles a week. I walk almost every day as well. Fortunately, I’ve been able to stay in reasonably good shape, especially for my age. To get ready for the Camino I’ve determined that all I really need to do is spend a little more time walking. I’ve decided to continue running three or four days a week, usually 4-6 miles every other day. I’ll also hike occasionally and walk before and after each run. By the time I leave for Spain, I plan to have walked at least two back-to-back days of around 15 miles. That should prepare me well. This past Monday I walked a little over 11 miles, and yesterday I hiked a 7.8 mile loop on the Pine Mountain Trail with my good friend Alton. Along the way my buddy shared some of his Camino experience and answered several of my questions. I appreciated his insight. Later in the afternoon I joined my other Camino-experienced friend, John, for lunch. Like Alton, John was happy to answer questions and provide what should prove to be some valuable information. It was interesting to see different perspectives on a couple of issues from two men who had both walked the trail last spring. Today I’ll run, walk, read, write, and wait. I wouldn’t say that I’m anxious, but I am definitely in an anticipatory state. With only a little over a month remaining until my departure, I expect the time to pass quickly. The Camino de Santiago is just over the horizon. Immediately after booking my flight to Madrid, I ordered a copy of John Brierley’s A Pilgrim’s Guide to the Camino de Santiago. Even though I already had an older edition that I’ve been perusing for a couple of years, I figured it was better to travel with the most recent publication. The book arrived in the mail from Amazon two days later. I’ve begun reading; however, I don’t plan to try to absorb all of what Mr. Brierley has to offer prior to my departure. I do want to become familiar with the route, at least in a minimal sense. But like the guide suggests, I will let the path lead me rather than try to pre-determine my every step. One thing that the author strongly suggests is that pilgrims have a “spiritual purpose for taking the journey.” At the present I haven’t quite determined if I do. I suppose I’ll know when that occurs, and I fully expect that it will. Like with my steps, I’ll let the path determine my inner journey as well. For now I just plan to read about the Camino. I’ll walk some each day and continue to run four or five days a week until I leave. Occasionally, I’ll train with a full pack. I hope the “full” pack will never weigh any more than fifteen pounds. That seems like a reasonable goal. Over the next five weeks I plan to write a few pre-walk entries in this journal. Some may be informative while other will be reflective. Like with the walking, I’ll let the spirit lead. And I’m looking forward to finding out exactly where that is. I posted this entry at trailjournals.com on Don’s 60 birthday, July 6. “When are you going to do the Camino?” one of my good friends, John, asked as Linda and I shopped in Lowe’s last Monday. “I plan to go one day,” I responded. “I’m just not sure when right now. John undertook his walk from St. Jean Pied de Port to Santiago last summer. A few months later he shared stories from his pilgrimage with our group of running buddies one morning over coffee. Producing his certificate of completion, it was obvious that John’s journey had been both physical and spiritual. So last Tuesday, the following day after that chance meeting with my friend at Lowe’s, I decided to search for plane tickets to Madrid. I check delta.com regularly like some people monitor the stock market. Always looking for a deal, it occasionally doesn’t even matter where I go. I just like a bargain. When I spotted one departing from Atlanta in mid-August, I only vacillated for about an hour before hitting the “purchase” key. I too was going to Spain. “I just booked a flight to Madrid,” I sent in a text message to Alton. “You are like me……a restless soul,” my friend responded. Alton was right. Lately I’ve been restless. The decision really wasn’t a difficult one. In six weeks I’ll embark on another adventure…..a journey…a pilgrimage. As I write this today on what would have been my brother’s 60th birthday, I’m thinking about Don and what he would have said. He would have reminded me to “be careful.” And I will. And just as I did when I successfully thru-hiked the Appalachian Trail, I will have my brother with me in spirit. Physically, I’ll travel alone. But within, I’ll know that Don is with me. In about five weeks I’ll be heading to Spain. I’ve written three pieces that I’ve put up at trailjournals.com under my Camino de Santiago journal. Like I did on my 2013 Appalachian Trail thru-hike, I’ll post entries there as well as here. So tonight, I’ve decided to go ahead and post those first three entries. I hope you enjoy following along on this new journey. In January of 2016 I began this journal with the opening line, “It’s time for a new adventure.” It turned out that it wasn’t time for that “adventure” then; however, I think it is now. Therefore, I’m starting again with a little different twist on my upcoming pilgrimage. On September 2, 2013 I completed a five month, eleven day thru-hike of the then 2,185.9 mile Appalachian Trail. While engaged in what was certainly one of the most grueling endeavors of my 62 years on this earth, I vowed during the final few weeks of the ordeal that “every step I took was a step that I would never have to take again.” I broke that vow in the summer of 2014 when I joined my long-time friend Alton for a return to the A.T. in Maine. The hikes were short, and I carefully selected sections that weren’t quite so demanding. It was during that time together in Maine, however, that Alton began seriously discussing his desire to one day complete a long distance hike of his own—not on the Appalachian Trail, but along another popular walking path on a different continent. The hike would be a pilgrimage—a walk from the village of St. Jean Pied de Port in the French Pyrenees to Santiago de Compostela. 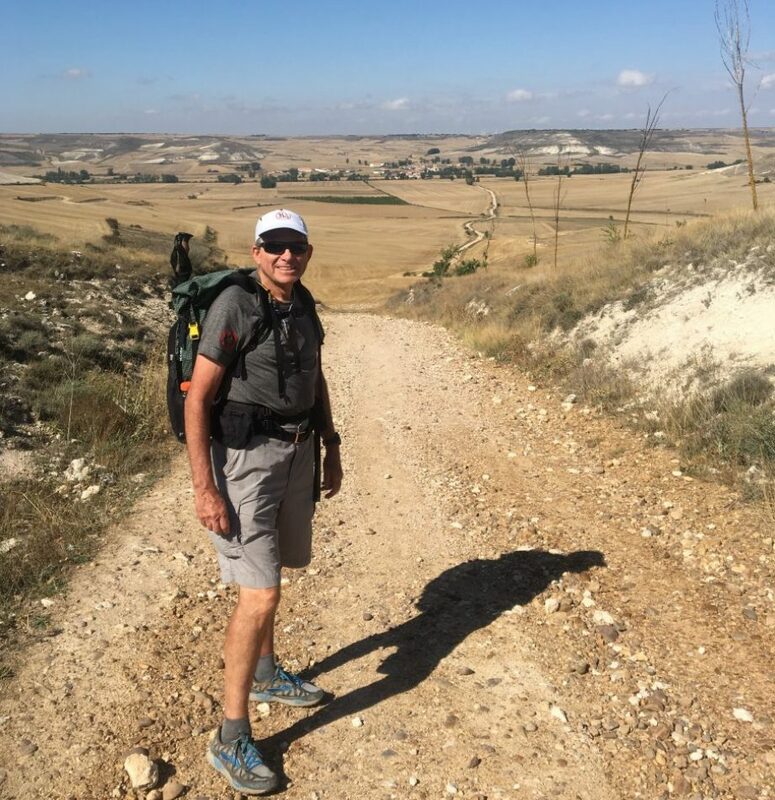 As I listened to my good buddy’s strategy for his life immediately after retirement, I too thought that I would join him on the Camino de Santiago, the Way of St. James. We had actually been talking about undertaking the Camino since the summer of 2007. It was on a section hike of the A.T. in Vermont that we met thru-hiker, Tao. Joining the young lady for a couple of days, both of us were fascinated by her descriptions of the Spanish countryside. We were equally intrigued as she talked of the spiritual phase of her Camino journey. “We need to do that Camino one day,” Alton noted as we struggled up one of the steeper Green Mountains. “Sure,” I replied, not really as excited about a trip to Spain as I was about finishing the Vermont section of the A.T. So yesterday, almost on a whim, I purchased a plane ticket to Madrid and began researching modes of transportation between the capital city and Pamplona. From Pamplona I’ll still need to figure out how to get to St. Jean. I’ve already made a reservation for the first night on the path at a hostel in Orisson. From there I’ll walk on to Roncesvalles. After the first two choreographed days, I expect to just take one day at a time. At least that’s the plan for now. With less than seven weeks until departure, I suppose I need to brush up on my Spanish and begin reading some about northern Spain and the Camino. I also need to decide just how little I will need in my pack for the almost 500 mile hike. And, of course, I’m writing again. Just as I did on my 2013 thru-hike of the Appalachian Trail, I plan to write and post every day that I’m in Spain. As I’ve already said, now just seems like the right time for another adventure. Only time will tell as to whether the decision is a wise one. When I thru-hiked the Appalachian Trail in 2013 I spent six nights in Erwin. The small, northeast Tennessee town, tucked between I-26 and the Unaka Mountains, provides the perfect setting for a slack packing base. As I mention in both of my books, I stayed so long in Erwin that I did my laundry twice and even got a massage. I would have duplicated the massage yesterday; however, the therapist supposedly departed for parts unknown and a replacement has not been found. My ailing back had to settle for ice packs and ibuprofen. Back in 2013 I chose the Super 8 as my home away from home. I’m here again. Even though I did take one day off while here (the second on my journey to Maine), I hiked five days, returning to the same room every night. From Devil Fork Gap, about 35 miles south of Erwin, to Carvers Gap, about 35 miles north of town, I spent every night in a bed. Each of the aforementioned trail heads is in proximity to a paved road and provides ample parking for several cars. This is one of the easiest sections of the entire A.T. to hike using the Don’s Brother Method (road to road hiking). After my fall yesterday I was not certain that I would be able to go today. Since Dynamite decided that she didn’t really want to slog along a slippery trail, I never had to make the decision. So instead of hiking, I checked out the severity of my “injury” with a 4 mile run around Erwin. At about a 10:00-10:30 mile pace, all went well. I felt like I could have hiked even though my back is a little stiff and sore. Other than being somewhat “stoved up,” as my grandmother would have said, I’m fine. While running along Main Street, I even located some possible places to partake of a meal later in the day. The Choo-Choo Cafe looked like a good spot. Around noon May and I ventured back into town for lunch. After reading a sign on the glass door of the Choo-Choo, “On vacation; back on Thursday,” we walked farther down the block to the Clinchfield Drug Co. A pharmacy from another era, the establishment sports a lunch counter with authentic stools that looked as if they had been around since the 50s. My hiking buddy and I both selected the daily special: Hamburger steaks, fresh mashed potatoes, green beans, and a toasted roll. The meal even came with iced tea and dessert. I chose the Mounds yum-yum; May tried the Butterfinger. Each complete meal set us back $5.95 plus tax. I would highly recommend this nostalgic dining experience if you ever find yourself hungry at exit 36 off I-26. The plan for tomorrow is to hike. May and I will return to the trail at Spivey Gap and make our way north to the Nolichucky River, the closest trailhead to the town itself. The forecast is again for rain with potential storms. If it looks dangerous, Dynamite might decide to alter her plans. Hey, I’m just here to support my friend for a few days. When I thru-hiked I wanted to make the decisions. In this role I’m fine with her making the calls. I want to hike, so I hope the weather cooperates. If it doesn’t, perhaps I’ll go on a small scale book selling expedition. Either way will be fine. After all, I’m getting to hang out near the Appalachian Trail.